One of the primary causes of social anxiety is impostor syndrome. Impostor syndrome can affect almost anyone with feelings of self-doubt and unworthiness. Left unchecked, impostor syndrome leads to an endless cycle of social anxiety, over preparation and procrastination–while avoiding the real work that needs to be done. However, by understanding where impostor syndrome comes from, such as perfectionism and fear of failure, you can break this impostor cycle to become a happier, more productive person. Sometimes even people who reach great heights of success do not believe that they should be there. Constant doubts creep in through their thoughts, claiming that they are not worthy. Sometimes this can drive people to improve, but all too often, over time it can begin to crush people under its weight. It doesn’t take huge success to feel like an impostor. Common employees and freelancers may suffer from impostor syndrome. Even a small amount of success will make you feel like a fraud if you are not confident in the quality of your own work. Do you ever question your achievements (no matter how small)? Do you sometimes imagine that at any moment, someone is going to expose you as the hack you think you might be? 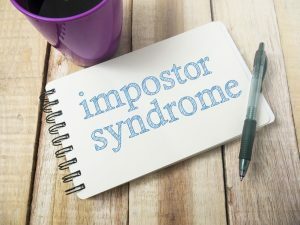 While it was first noted in women, in a 2011 study published in The Journal of Behavioral Science researchers Jaruwan Sakulku and James Alexander found up to 70 percent of both men and women suffered from symptoms of impostor syndrome. For most people, impostor syndrome symptoms do not actually inhibit their ability to get their work done. it does, however, cause unnecessary stress and anxiety. But for some people, impostor syndrome can be debilitating. It can cause a specific kind of cycle of social anxiety — over-preparation and procrastination. Over-preparation and procrastination can prevent them from doing the work that needs to be done. achievement-related task — leads to anxiety and self-doubt over the result. Over-preparation or procrastination — leads to distraction from anxiety about the result. Discounts positive feedback — tells him/herself achievement is only a result of overwork or luck. Self-doubt increases — because positive feedback is ignored, this leads to more anxiety when tackling the next goal or task. Over-preparation — When an individual spends extra time preparing for a task in order to avoid failure, this can lead them to wonder whether they’re worthy of their success. They might wonder if they would have succeeded without the extra effort. Constant procrastination — this is a more obvious way to avoid the task. When procrastinators succeed, they tend to pass it off as luck. They once again doubt whether their success is deserved. Impostor syndrome is rooted in how people think about themselves. It is often related to fear of failure or a desire to be better than everyone else. Researchers Sakulku and Alexander suggest that the root causes of impostor syndrome lie both in a person’s innate personality traits and as well as the environment (family, school) they grew up in. In another 2014 study, published in Procedia researchers found people with impostor syndrome tend to need validation from others. They are sensitive to criticism and fret about less-than-perfect results. How children learn to deal with success and failure has a significant effect on impostor syndrome. Many people with impostor syndrome did not have to deal with failure much growing up. This does not give them the chance to build the skills needed to pick themselves up after they fall. If school is easy, this can lead to trouble when they encounter real failure in college or in adult work environments. Additionally, when children grow up in an environment where talent is valued more than hard work, it implies that failure is a judgment on their character and not just their work. This can lead to “Feelings of shame, humiliation, and inauthenticity,” according to Sakulku and Alexander. It isn’t possible to change your core personality or how you grew up, but if you’re worried about impostor syndrome, you can fight it with a little conscious effort. Left to grow out of control, impostor syndrome often leads to other problems, such as poor work performance, work dissatisfaction, and even depression. At worst it could threaten the success that triggered feelings of being an impostor. Think of failure as an opportunity. It’s better to try and fail than to do nothing at all. Even if you do fail, you will learn things along the way. Remind yourself that perfection is not possible (for anyone). Nothing is perfect, and nothing you produce will be perfect either. Forget about perfect and focus simply on working well. Focus on the process, not the goal. Instead of thinking (and getting anxious) about the result you want to achieve, decide on a process that will get you to that result and stick to it. Once you have the process set up, forget about the goal itself and just focus on getting down to work one little bit at a time. At the end of the day, the only real way to beat procrastination and over preparation is to start on the real task at hand. Instead of reading one more book before you tackle that master’s thesis, get started on the thesis. The more you make starting a habit, the easier it will become. It takes hard work to break bad habits. You can break the impostor syndrome cycle with a little effort and awareness of what you are doing to yourself. Social anxiety is an unnecessary and debilitating disorder that you do not have to live with. Evidence-based therapeutic techniques are available. Working with a life coach is also effective for social anxiety as it gives you the ongoing support you need during a critical point in your life. Road 2 Resolutions offers cognitive behavioral therapeutic and executive coaching services for people who struggle with anxiety related issues.